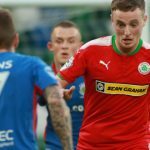 Cliftonville claimed their first home win of the Danske Bank Premiership season with a 3-0 victory over Institute under Solitude’s Friday night lights. 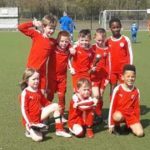 Ahead early on when Ryan Curran opened his account for the Club, the Reds quickly doubled their advantage courtesy of Joe Gormley, who would later wrap up the scoring with his third headed goal in as many home outings. 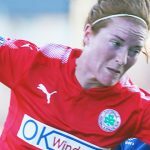 Determined to atone for a lacklustre display in their previous outing against Newry City, Cliftonville came roaring out of the traps and broke the deadlock after just six minutes when Jaimie McGovern’s long throw-in was challenged for inside the area by Curran, who was quickest to react to the breaking ball and slammed a powerful low drive past goalkeeper Martin Gallagher. Soon later, it was 2-0 and Curran once again played a key role; his clever flick sending Jay Donnelly free down the left to produce a cross that Gormley was only too happy to capitalise on in the middle. Stute almost halved the deficit on 20 minutes when a wonderful delivery from Michael McCrudden picked out Jamie Dunne, but he miscued his point-blank attempt and Aaron Donnelly was able to touch the ball behind for a corner kick. Chris Curran then saw an attempt deflected wide by former Reds defender Caoimhin Bonner and Donnelly headed straight at Gallagher before the first-half ended with the visitors once again unable to make the most of a promising opening. After surging through and evading a challenge by keeper Richard Brush, McCrudden found the angle too tight for a shot and dashed past Brush again before teeing up Dunne, whose close range shot was superbly blocked by Levi Ives before the ball was smothered by the Cliftonville stopper. 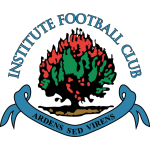 Institute threatened again shortly after the turnaround when Ronan Doherty dragged wide from a golden position and, after Ives had scaled the bar with an attempt at the other end, both Thomas Maguire and Chris Curran found themselves outnumbered in bids to negotiate paths through a busy penalty area. A third goal was always likely to be required to settle the issue and it duly arrived on 66 minutes when Maguire’s persistence was rewarded with a McGovern cross that Gormley rose to nod in at the back post. Conor McDonald volleyed wide and Gormley was blocked off in his bid to seal a hat-trick as Cliftonville comfortably held on for three long overdue, but fully deserved, Premiership points. 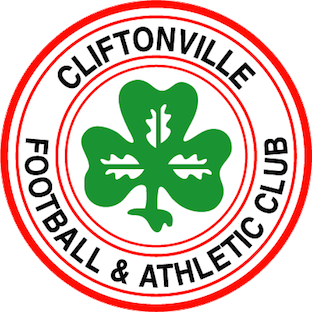 Cliftonville: Brush, McGovern, Ives, Breen, C Curran, R Curran, Catney, Gormley, J Donnelly, Maguire, A Donnelly. Subs: Neeson, Garrett (Maguire, 67 mins), White, McDonald (J Donnelly, 63 mins), Lavery (Catney, 74 mins), McMenamin, McNulty.